you know those girls who wake up an extra hour early in the morning so they can apply ten layers of makeup and shellac their hair? i have never been one of them, not even for a single day. so, when i decided to try a new hairstyle, i skipped the (logical) salon route, opting instead to give my favorite animator some very vague instructions, before letting him loose in my hair. if it all went wrong, then at least i would have an excuse to knit lots of hats. i expected to wake up the next morning full of regret, but when i stepped in front of the bathroom mirror, i was completely amazed. me: wow! this actually looks okay. i like it!!! him: it does... and that's the problem. me: what is that supposed to mean? him: don't get me wrong. you can pull it off with the crazy high cheekbones and that thing you do with the eyeliner. me: you mean, occasionally putting some on? him: [ignoring my last comment] ...but the second you start talking, they'd realize that you are the biggest nerd on the planet. ...then he grinned and hurried away, which was very wise. 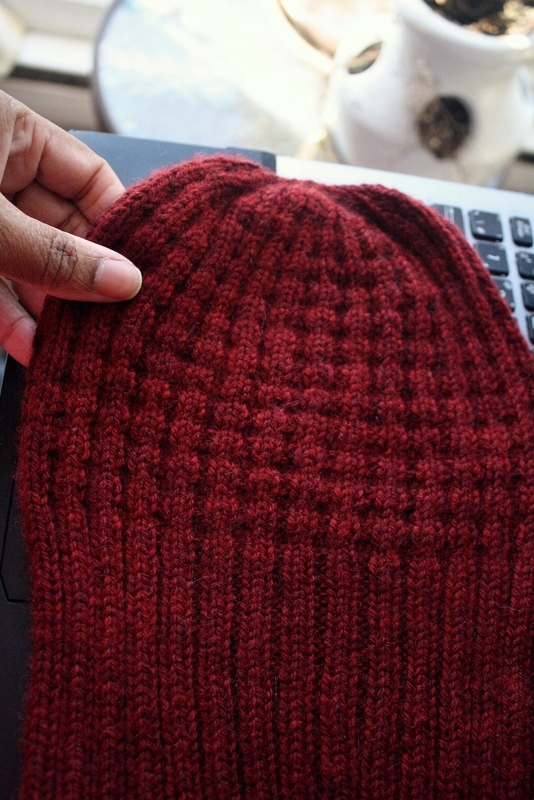 i did end up knitting a new hat, but not for me. 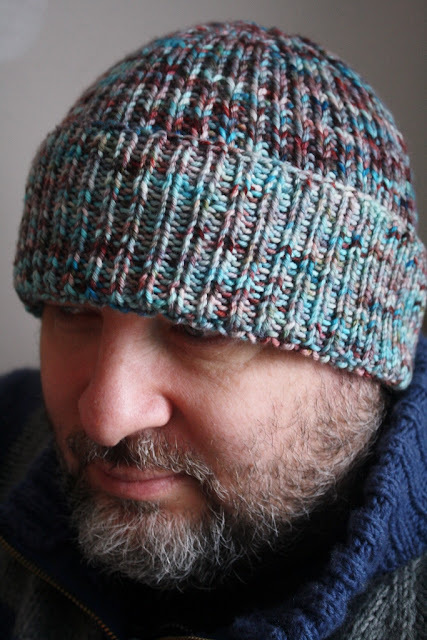 despite his repeated requests to move to a hand-knit-only sock lifestyle (my fault for knitting him a pair), i cannot seem to muster the enthusiasm to knit more of them, so i copped out and made him a hat instead. 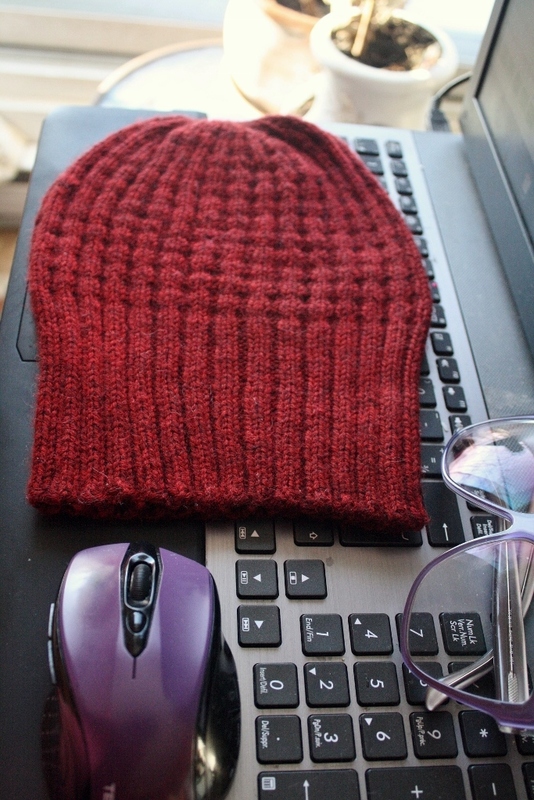 i knitted him a hat last year out of some of my own hand-dyed yarn, which he wears everywhere (inside and out) during the cold months. me: why are you wearing a hat... at three in the morning... in the studio... in your underwear? him: i like this hat. it feels good to have your handiwork so well received, but i figure he could always use a spare for when he (inevitably) loses... or washes... that one. the new hat features a simple textured stitch, and a generous brim, as he likes to wear his hats folded and pulled down over his ears. 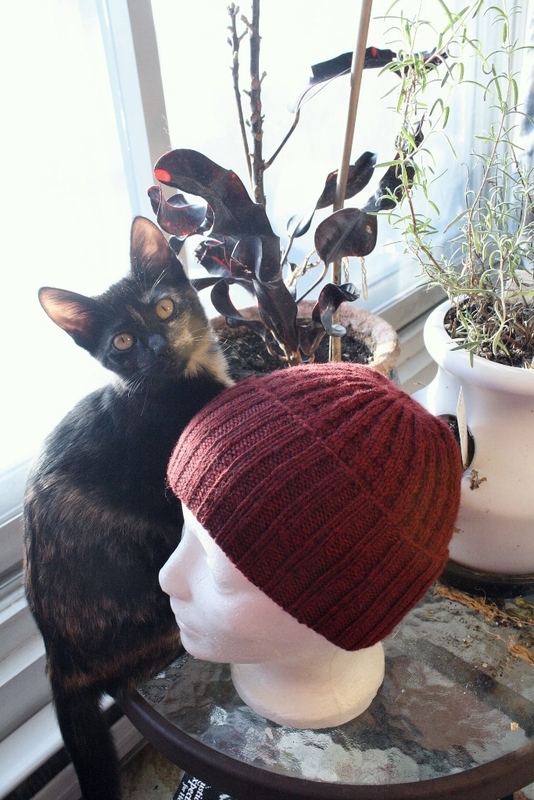 the pattern is Violet Waffles, and it is (currently) FREE on Ravelry. i knit this one in some Knit Picks Swish DK in the colorway Garnet Heather. 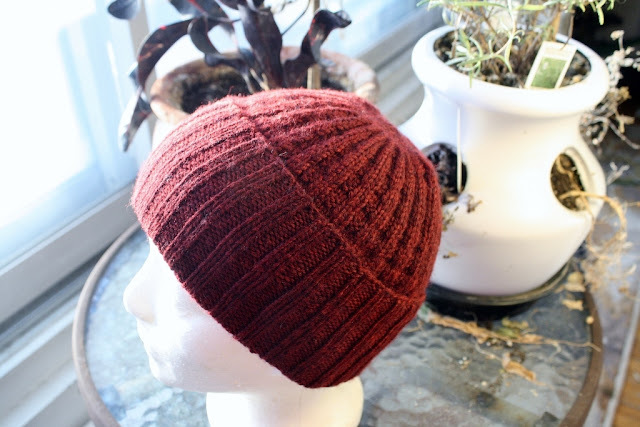 i found a few balls of this yarn at the back of my stash closet, leftover from some old project (though i could not begin to guess what that might have been). 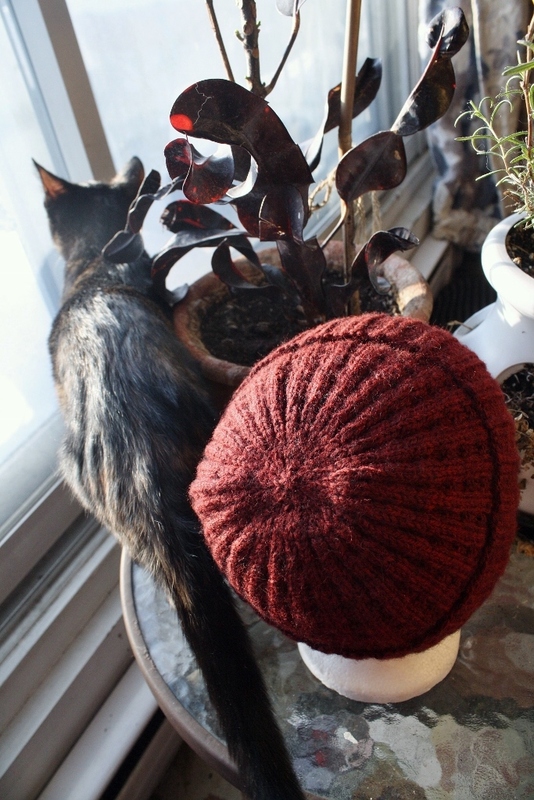 the yarn is 100% superwash (washable) wool, but his hat is at least 3% cat hair. 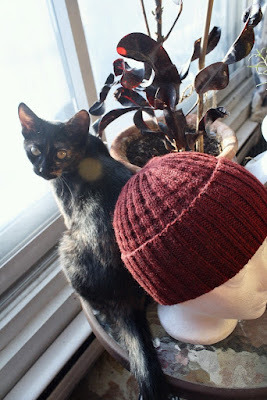 speaking of which... it is a scientifically proven fact that taking a photo of knitwear is guaranteed to summon a cat.